This lovely, light, bright one bedroom apartment has everything you need for a truly enjoyable stay in Wellington. First of all it is well equipped with a nice spacious living area, new furnishings, brand new shower and comfortable bed. The balcony has nice views down to the waterfront with glimpses of the harbour. Then there's the location which is very hard to beat. As well as being opposite Te Papa and the waterfront, the famous Sunday markets are across the road and there's a big New World supermarket only a block away. For dinner or breakfast you're also spoilt for choice with the highly regarded Hippopotamus restaurant across the road in the QT Museum Hotel (they do great French Toast!) or Pandoro Panneteria just around the corner plus a myriad of others on Allen Street and Courtney Place. Theatre options are close by including Circa, the Michael Fowler Centre and the Opera House, plus Reading Cinemas. If its shopping you're after while there are a few nice boutiques close by, Lambton Quay is a 10 min walk along the waterfront, or stroll up to the bo-ho Cuba Street precinct a similar distance away. Buses along nearby Courtney Place will take you up Mt Victoria to the lookout over the city, or out to Miramar to Weta Workshops or the airport, or down to Parliament Buildings. 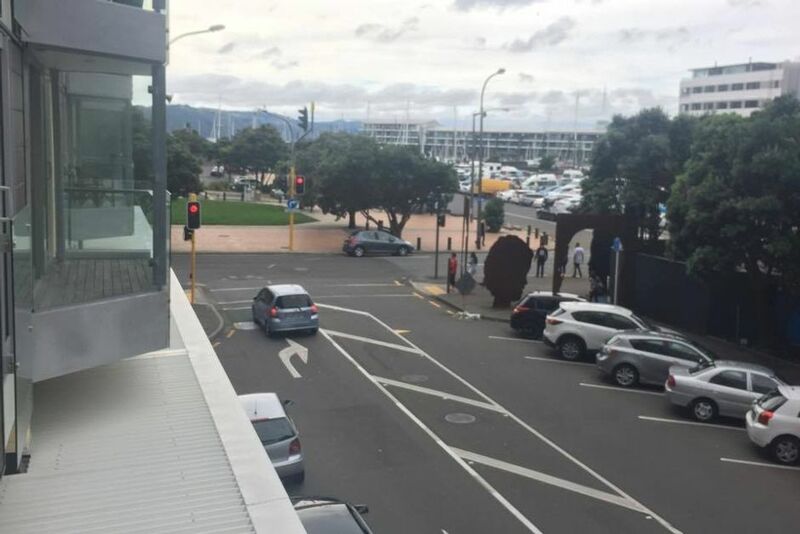 If you're in Wellington to work, the CBD is a 10 minute stroll along the waterfront, or conferences and weddings are often held at Te Papa or nearby Bostshed or the Wharewaka on the waterfront. The apartment is on level 1, so only one flight of stairs up from the ground floor if you can't be bothered waiting for the lift. A carpark is available for an additional charge on request. As this is an apartment building, occupants must follow body corporate rules which will be left out to read. The primary rule relates to all residents having peace and quiet so please don't plan any noisy activities or invite in large groups of people and leave the apartment as you found it. Extras: Cleaning (Required, NZ$35.00 per stay); Linen (included); Carpark (Optional, NZ$25.00 per night); 2 nights minimum stay. Discounts for stays over 7 nights. Modern, well-maintained building, with balconies to all apartments. This is a perfect place to stay in Wellington. The apartment is modern and secure with parking available on site. Te Papa is just across the street, downtown Wellington,Queen’s Wharf and Oriental Bay are all easy to walk to in 20 minutes, give or take. There are lots of good, funky restaurants and bars nearby. There is a major supermarket one block over if you decide to dine in. The owner is extremely prompt when responding to any texts or questions. We would gladly stay here again on future visits to Wellington. This is a clean, comfortable space with great light in an ideal location. We spent an entire day in Te Papa and could pop back to the apartment for lunch midway through our day. It’s a great location from which to explore so much of Wellington and there are lots of restaurants nearby to choose from. A huge market is conveniently two blocks away, so you can also grab whatever you need. Beautiful property located ideally and perfectly for our needs. Well resourced and provided the perfect return to sanctuary after our long days out and about. Great place for a single or couple that wants to see all the great sites of Wellington. Right across from Te Papa museum and harbor. The location could not be any better, overlooking the waterfront and across from the museum. Underground parking was very nice as the city is busy and full. Very walkable to all activities. The apartment is basic but everything we needed to enjoy the city. I spent there 3 weeks there and I enjoyed a lot this apartment, really nice with all the things that you need to feel at home. The location then is perfect for discovering the city!